Gauging WordPress Podcast Interest I've come up with an idea for a podcast, how it will work, and the format for it. But I'd like your input. Over the break, I had a lot of time to think about different things as it relates to Pressware and this blog. One of the things I’ve been thinking about for months now is the idea of starting a podcast. I’m not particularly interested in doing the “interview others” for a podcast because other people are doing them so well and they are interviewing such interesting people. But I did wonder if there’s not some room for a question-and-answer format. I know many podcasts end their episodes like this. However, I’m interested in experimenting with short podcasts (that is 10 – 15 minutes max) and those that answer questions. If you have five minutes to spare, would you mind answering the following survey? It’s not closed to anyone, and this will help me to gauge interest in doing this. All submissions are kept completely private. The podcast will be short (20 – 30 minutes in length), will have a primary format, and will be geared towards anyone involved in WordPress. Still curious? Read the rest of the post. 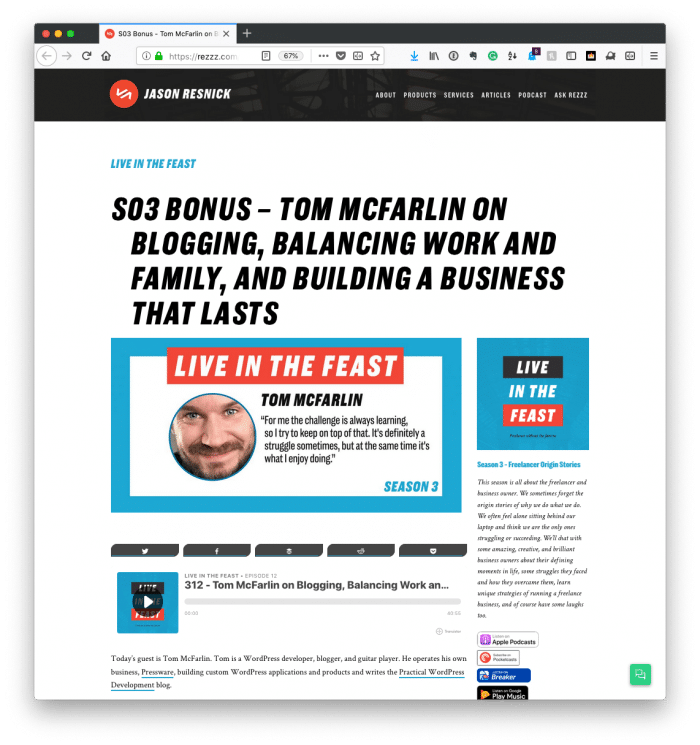 Live in the Feast Podcast, Season 3 In Live in the Feast, I also talk a bit about theme development, plugin development, web application development in the last decade, and more. It’s been over a year since I’ve done any public speaking or participated in any podcasts for any significant amount of time. This is large because I was focusing on work and all things outside of it. But when my friend Jason shot me an email earlier this year if I’d participate in his Live in the Feast podcast, it was an easy decision. I’ve had the pleasure of knowing Jason for some time over the last couple of years. We both met on Twitter, though we’ve [regrettably] yet to meet face-to-face, and share a few common interests the least of which is not The Walking Dead (to the point where we had our Slack channel with others for discussing the episode). If you don’t bother to read the rest of this post, you can check out the episode page for more information. Last week, I took the entire week off of blogging and all things related to work and social media. My wife and I celebrated ten years of marriage back in April and just had the time to celebrate it at the end of September. Anyway, one of the things that’s interesting about taking time off is that it takes a day or two to really decompress, you know? You have to mentally get out of the mindset of work, of keeping up with your apartment or home and being a parent (if you are a parent). We spent the majority of the time literally doing nothing but sitting on the beach and reading. But during time at dinner, we’d talk about various things such as our goals for certain things we have planned. And for me, one of the ideas I’ve been toying with for sometime now is the idea of starting a podcast. But the thing that anyone who’s anyone doing a podcast faces are several inevitable questions. Products, Services, Blogging, and WordPress with Matt Medeiros A good conversation with a great friend on products, services, blogging, and WordPress. 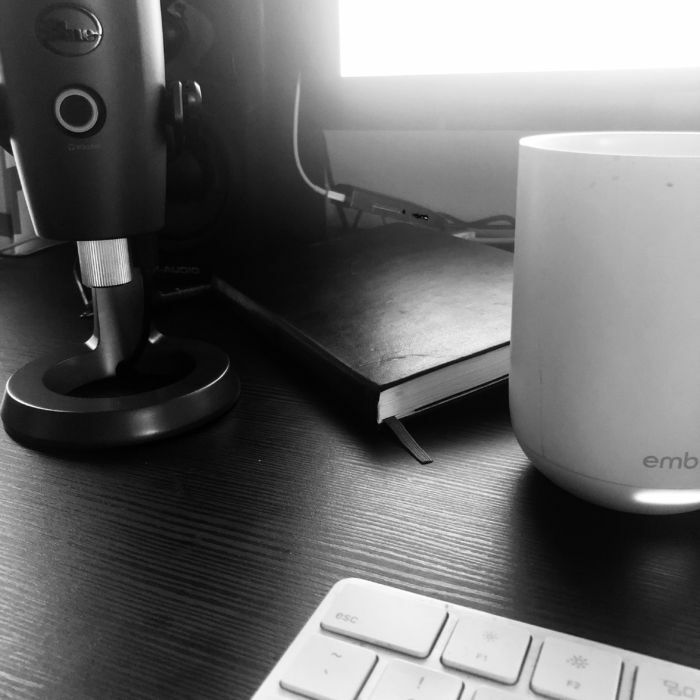 A couple of weeks ago, I had the opportunity to chat with Matt Medeiros [once again] about various topics related to WordPress. I’ve had the pleasure of knowing Matt for several years now, got a chance to hang with him at WordCamp US 2016, and continue to chat with him (when he’s not #medeirosing) both on podcasts and via other channels. Yup – it’s one of those cases where you meet someone on Twitter, and they become friends. That does happen, you know. Retweet if you've ever met someone face-to-face after previously only knowing them from Twitter. Instead, how about some more fun (or at least more interesting) things? 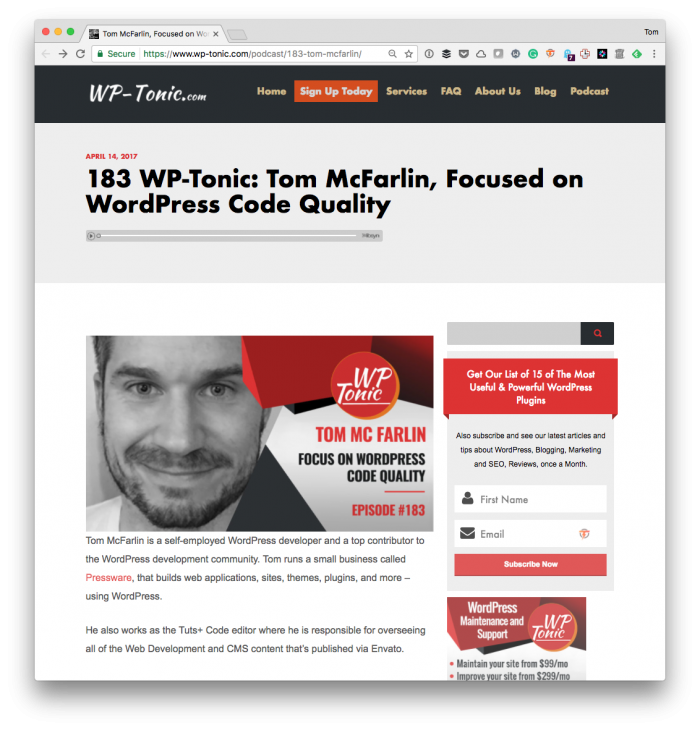 Last week, I had the pleasure of talking with John Locke and Jonathan Denwood on WP-Tonic to talk about a variety of things regarding the WordPress economy, self-employment, development strategies, observations around the software, along with a variety of other topics. Before covering what it is that we covered, I do recommend checking out their library of podcasts. They’ve talked to people who I think are worth a follow and who are far smarter, accomplished, and have unique insight on a variety of topics in the WordPress space.